W e float on rippled water under rustling trees. A blue heron stands in knee-deep water, watching. As we get closer, he wings a few yards down the shoreline. Bald eagle and osprey swoop overhead against fluffy clouds. Every time I fill my lungs with crisp air, the list of chores waiting at home seems less overwhelming. If that’s not the goal of an in-town escape, what is? This particular Saturday, my husband and I postpone several errands for a half-day getaway to Sweetwater Creek State Park, the Georgia State Park closest to the Atlanta metro area. We loop around I-285—an easy commute on a Saturday morning—to reach Lithia Springs. The park seems tucked away like a dog might hide a favorite bone, but GPS guides us to the entrance. Our first stop is the Visitor Center for a trail map. The award-winning LEED-certified building, one of the most environmentally responsible buildings in the country, is staffed by friendly rangers and houses informational brochures, classrooms for lessons on nature-based topics such as snake identification, historic exhibits including Native American artifacts and Civil War remnants, wildlife displays, plus restrooms and a gift shop. Among the 7 miles of trails available, we step onto a five-mile loop through some of the park’s most remote areas. Picturesque and peaceful, the well-worn “white trail” weaves through trees alongside the park’s namesake Sweetwater Creek. At the 1-mile mark it overlooks the ruins of the New Manchester Manufacturing Company, a textile mill burned during the Civil War. We continue up rocky bluffs past bursts of seasonal blooms, fern beds and rapids. Next we head to the rendezvous point for our reserved, guided, two hour kayak tour. 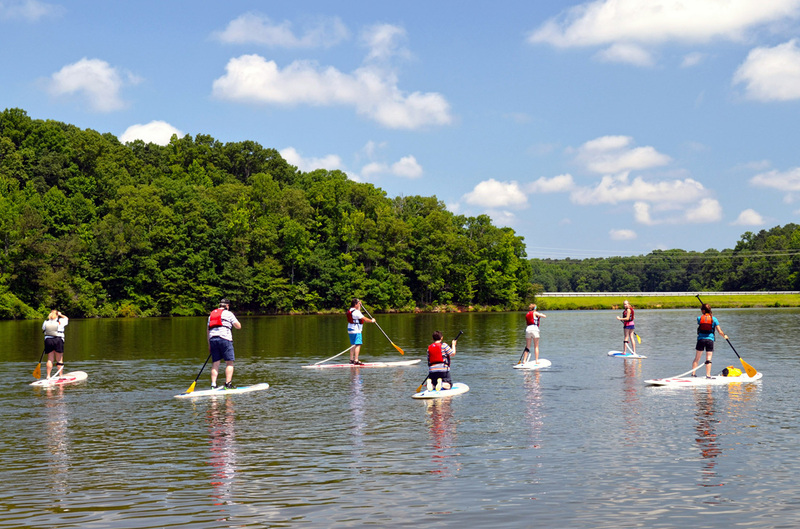 This park offers two paddling trails: one in Sweetwater Creek and the other in the 215-acre George Sparks Reservoir. We climb into a tandem kayak and paddle past ducks out toward the center of the lake. The reservoir is sometimes drained, our guide, Andy Wooten, explains; the last time it was empty archeologists unearthed several Native American artifacts. We learn as we paddle, since our guide shares area history along the route. “Do you want to go through the tunnel?” asks Wooten. The only way to reach one section of the lake is to paddle through an underpass. We aren’t worried about spider webs, so we don’t hesitate. We enter a different ecosystem with calmer water, taller grasses and even different wildlife. There, we spot the great blue heron. We paddle near a beaver dam, past eagle and osprey nests, alongside wild azalea. A cluster of 10 yurts overlooks the lake. Next time we talk ourselves into escaping chores, we’ll stay overnight. But even a few hours are enough to feel refreshed. The Park Paddlers Club is a fun challenge to paddle 24 miles in six state parks: Sweetwater Creek plus Chattahoochee Bend, Crooked River, George L. Smith, Reed Bingham and Stephen C. Foster. Rent a canoe, kayak or stand-up paddleboard, or bring your own boat, and paddle the water trails through diverse ecosystems. Buy a membership card at a participating park office for $10, get it punched after each completed paddle, then get a free T-shirt to commemorate your accomplishment.